What was the old shop (and was much too small for that purpose) will now be the storage and assembly area. We’ve moved both the living room and the bedroom in the process, and the new smaller rooms we now use for them are actually much more comfortable than the rooms which are now my workspace. This also means that the entire workshop are is completely separated from the living space by a single door. I much prefer the separation. I still have to get an electrician in to run a new circuit or two and I need to do some work on some organization and cleanup, but it feels good to be mostly in place. So let me repeat what I am reading. 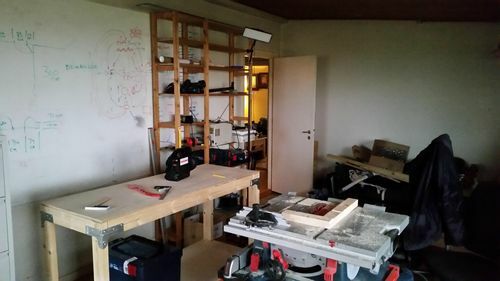 You now have your work shop IN the house and you don’t have to heat or cool another shop building? That is so SMART!!! I tried that back in 2003-5 but I wasn’t able to close off my living room from the kitchen so I had pine and maple for REAL fiber in my salads. The wood dust was getting all over the place. Now, we moved to a much smaller house with a lot of land for the ranch and farm to expand with the promise of making this big 25×30 shop (Quonset hut) we have dragged around since 1999 happen for my shop. 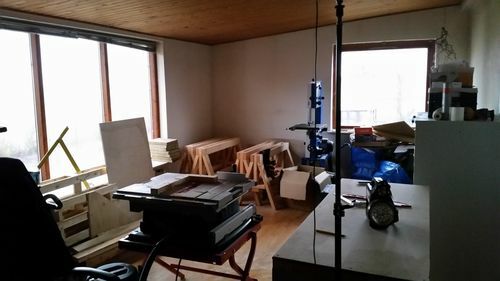 I have threatened to take the master bedroom and turn ‘IT’ into my shop as it is the only room in this much smaller house usable for wood working space, and somewhat weather user friendly. I am very happy to read other industrious people are doing what I thought of as a good idea. MY husband on the other hand, can NOT comprehend my needs for the big shop! He thinks working outside in inclement weather on dirt dragging out tools is fine! My neighbor sent over her OLD green house and I am very quietly, sneakily, turning it into a storage shed for the stuff in this little house and just might do what Ted is doing to one of the bedrooms, Master bedroom is STILL in the running! :) If any gals or guy out there wants to chime in on how to get that needed shop, let me know!! !